HOW TO CARVE: WATERMELON LEGOS - What About Watermelon? When I was a kid, I loved Legos. Give me a bin of those things, and I could build pretty much anything. Houses, cars, spaceships, you name it. Now that my daughter is three (soon to be four), she’ll be entering the “Lego phase,” and I’m really looking forward to helping her create all sorts of things, too. Until she’s ready to tackle the Legos, we’ll have to settle for carving Legos out of watermelon. And considering that she’ll probably try to eat a few of the real ones (I’m pretty sure I did), it’s probably a good thing that we’re starting out with some the edible version. You can use red seedless watermelon and yellow seedless watermelon to create two Lego blocks, but I only created a red one. 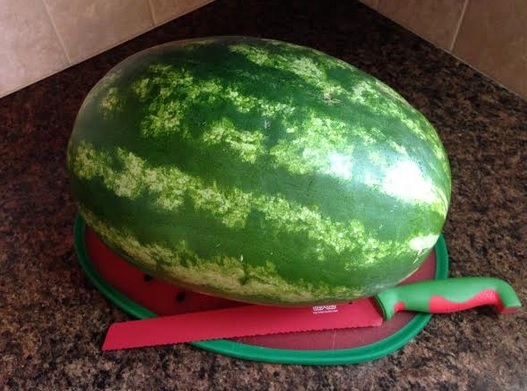 As always, before the knife even touches the rind, be sure to give your watermelon a good cleaning. 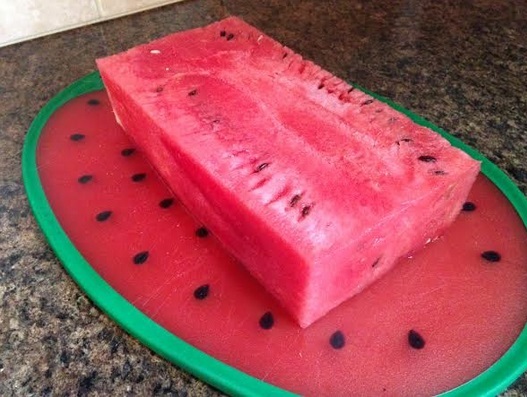 Cut the rind off the watermelon to create a large rectangular block of watermelon flesh. Be sure to set aside at least one slice of watermelon – about ¾ of an inch thick – to create the four little Lego top circles. Attach the top circles to the Lego base using toothpicks. That’s it! 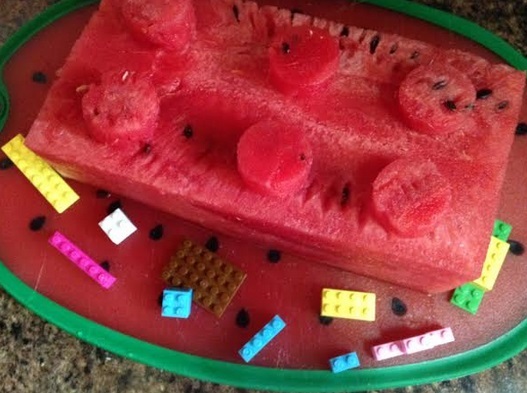 Feel free to decorate your watermelon Lego with real Legos or other toys. And when you’re done, stand back and admire your handiwork – and then chop that sucker up and eat it! What an artist you are. This is very cool. Thanks! It was a pretty easy carving, but a fun one, too!